The Book: The Weapon Shops of Isher by A.E. Van Vogt. Copyright 1951, printed in 1961 by Ace books, D-482. The Setting: Earth, 1951 and 4784. The Story: The Weapon Shops sell guns. Guns which cannot be used against others, except in self defense. The government of Isher wants to destroy the shops. Things get a little timey-wimey. Also, a boy doesn’t want to go into the family business, goes to the big city, and gets in some deep trouble. The Science: Clarke’s third law states that “Any sufficiently advanced technology is indistinguishable from magic.” This is the case with the Weapon shops. Their existence, their infrastructure, and their guns are all basically indistinguishable from magic. Apparently, the founder of the shops was a super genius who figured out how to imbue objects with the ability to determine the intent of an individual when an individual touches them. Magic. The rest of the Isher-world has to get by with corruption and not-a-little-bit of seediness. The Reaction: Here’s another book I had a good time reading. I would stay up late just to read some more. There are a lot of points of view, and a few jarring moments, not to mention, the author seems to have a man-crush on one of his characters. But it was fun. The Cover: Cover art by Harry Barton. Boy howdy, do I love this cover. Two guys in jeans and t-shirts are fighting in front of some super-neat device (a ray gun of some kind? ), against a future-city backdrop. There’s so much energy in this cover. And you know the guns are from the future because they have those three little rings around the muzzle. And did I mention they’re wearing jeans and t-shirts? So awesome. This explains some of the slight jarring I felt while reading, but they are sewn together pretty darn well. The Book: The Outer Reaches: Favorite Science-Fiction Tales Chosen by their Authors edited by August Derleth. Originally published in 1951. The paperback edition contains 10 of the 17 stories from the hardback edition. Published by Berkley Books, G-116. “Co-Operate—or Else!” – A. E. van Vogt, 1942 – A man and his mortal enemy, a super-intelligent, telepathic, space panther, must survive on an extremely hostile planet. “Good Night, Mr. James” – Clifford D. Simak, 1951 – A clever little story about a scientist who made a mistake and now must remedy it. Much fun. “The Critters” – Frank Belknap Long, 1945 – An old man lives high up in the hills, away from an alien invasion. Didn’t care for this one. “Death Sentence” – Isaac Asimov, 1943 – The government takes over the operations of a rogue archaeologist who has discovered an ancient civilization of robots-who-don’t-know-they’re-robots. “This Is the Land” – Nelson S. Bond, 1951 – The children of the last survivor of a nuclear holocaust bury him on the surface. “Ylla” – Ray Bradbury, 1950 – From The Martian Chronicles. I skipped it here. “The Green Cat” – Cleve Cartmill, 1951 – No one questions that there’s anything weird about a green cat with leaf-shaped ears. “Pardon My Mistake” – Fletcher Pratt, 1946 – A man, mad with jealousy, makes a mistake. “Farewell to Eden” – Theodore Sturgeon, 1949 – A man and a woman, awakened from a long cryo-sleep, leave a bomb ravaged earth for a better home. The Evaluation: These stories are all pretty good. And, if not, they’re pretty short. The idea of authors choosing a favorite tale is quite nice. “Good Night, Mr. James” is my favorite of the group as it hits a nice balance of clever, pacing, and length. The Cover: No credit for the cover art. Sadly, the scene on the cover isn’t from any of the stories, but it is a fine science fiction scene. Though, I have to say, is seems a bit dangerous to have pick axes in a low atmosphere environment. Next Up: The Weapon Shops of Isher by A.E. Van Vogt. The Book: Sentinels from Space by Eric Frank Russell. Alternatively Sentinels of Space. Copyright 1953, based on a story published in 1951, “The Star Watchers.” Published by Ace (First in Science Fiction), D-468. The Setting: Earth, Venus, sometime in the future. The Story: David Raven, daredevil pilot, is recruited by the government to secretly end the secret war that Mars and Venus have not-declared on Earth. But Raven has other things on his mind as well. Like the fate of all mankind! The Science: In this story there are mutants. Twelve types of mutants, each with special powers. And mostly, it seems, they use their powers for crime. Mutants, it is explained, developed especially on Venus and Mars because their folks were bombarded with cosmic rays. Fair enough. Radiation tend to have a mutagenic effect on cells. Superpowers, eh, maybe not so much. The Reaction: I was impressed with this story. It kept me guessing, the writing didn’t distract me, and the plot felt pretty solid, if a bit jumpy. For a book with a different title on the spine and cover (of/from), I wasn’t expecting a lot. But I found myself staying up late to read more. The Cover: Cover art by Robert E. Schulz. A man with lots on his mind – planets, black rocketships, and lots of clouds. Also, more groovy fonts. I’m a fan of this cover. Nice work. Next Up: The Outer Reaches edited by August Derleth. The Book: Beyond Infinity by Robert Spencer Carr. Copyright 1951. Published 1954 by Dell (#781). “Beyond Infinity” -1951 – Somewhat noir-y mystery/indirect observation of a space/time adventure. Good. “Mutation” – 1951 – Short but slightly tiresome story about survivors of an atomic blast and the mutations they deal with in their environment. The Evaluation: I enjoyed “Beyond Infinity” and “Those Men from Mars.” The other two were not great stories. The quality of the writing was decent, and fun in places. This collection is a solid “meh” from me. The Cover: A fine Richard Powers cover. A man, a woman, and an alien environment. And possibly a sign post. Next Up: Sentinels from Space by Eric Frank Russell. The Book: Alien Planet by Fletcher Pratt. Published in 1962 by Ace Books (F-257), this book is an expansion of the novella “A Voice Across the Years” (written with I.M. Stephens) published in Amazing Stories Quarterly, Winter 1932. The Story: A couple of guys are hanging out at their remote cabin in the woods when a meteorite strikes the nearby lake shore. Not actually a meteorite, some guy eventually emerges from the rock. This is Ashembe, space alien, smart guy, and transmuter of metals. Stuff happens. A quick escape is necessary and one of the guys, Alvin Schierstedt, ends up in the space capsule with Ashembe, ready to blast off for adventure. However, adventure ends up being stuck in a space capsule for a couple of years… Then adventure! They land on the alien planet, Murashema, and Alvin has to learn the language (guess he didn’t have time on the way there) and learn how to live in a new society on an ALIEN PLANET. The Science: One of the things I liked about this book is that it acknowledges that space travel can take a really long time and might, actually, be really boring once you’re doing it. Alvin takes the time to learn a Murasheman game from Ashembe, and to get really good at math, but not to learn anything about Murasheman society or language. Sigh. The Reaction: Not bad, but not great. Definitely out of the 1930s mold. And it has footnotes, sometimes saucy footnotes. I like that. In fact, that’s one of my favorite things about this book. The Cover: Cover art by Ed Emshwiller. I love this cover. Dude in a space suit, wibbly wobbly city, and giant-headed human-faced sky-octopus. Imagine my disappointment when there was never a terrifying sky-octopus in the story. Beautiful cover with a spunky font, but misleading. The Book: Sands of Mars by Arthur C. Clarke. Originally published in 1951, the edition read was published in 1954 by Pocket Books, Inc. The Setting: Space and Mars. Mostly Mars. The Story: A science fiction author and popular journalist travels to Mars for a story, but finds himself. The Science: Aside from the complexities of space travel and living on Mars (which feel realistically addressed in this book), there are a couple of notable science-y things that happen. One is that the protagonist discovers a species of Martian plant which releases pods of oxygen into the atmosphere. Widespread cultivation of the plant is planned as a long term method of re-forming the atmosphere to make it comfortable for human life. This is neat. I liked this a lot. Plants do exchange gasses regularly, so it seemed both plausible and convenient. The Reaction: Not what I was expecting from a book that proclaims “An interplanetary adventure!” on the cover. Sure, there are aliens. Sure, the protagonist finds himself in mortal danger a couple of times. But mostly, the main character is learning about himself and discovering new interests and old connections. Yet it was still a very good read. It felt genuine. Reasonable, even. The Cover: Cover painting by Robert Schulz. A dome, a rocket taking off, a couple of guys in tin-can spacesuits, a rocky alien landscape… what more can a girl ask for? Dreamy. Just dreamy. The Book: Beyond the Stars by Ray Cummings. The story was originally serialized in Argosy Magazine during February, 1928. The book was published in 1963 by Ace Science Fiction (F-248). The Setting: Earth, 1998, and somewhere beyond the stars, in a place called Kalima. The Story: Two strapping young pilots, an elderly scientist, and his two granddaughters (one of whom is blind) venture “beyond the stars” where they get caught up in the politics and adventures of a different planet. The Science: I’ve got to give it to Cummings for inserting a lot of explanation of his various gadgets and who-bobs throughout the book. Unfortunately, there’s still a lot of head scratching. The journey which starts off the adventures is not a journey by rocket, but by expansion. See, according the book, maybe the earth is just one of those things stuck in the space between atoms, so if you expand, you’ll end up in another world. Which is what they do. It almost makes sense, but… not quite. The Reaction: I wanted to like it, really I did. It definitely suffers from some of the problems that serialized stories suffer from – disjointedness, a forgetfulness of earlier characters, exclamation points, and weary adverbs. Cummings had a lot of decent ideas for sciencey gadgets and, apparently, a strong love of the Barsoom books (who doesn’t? ), because what starts of as a promising science-fiction adventures turns into a fantasy battle romp with hideous monsters and the occasional gadget. It’s a product of its time and it doesn’t age well. The Cover: Cover by Jack Gaughan. The cover is neat. The title is in some wacky font, and I’m a sucker for wacky fonts. 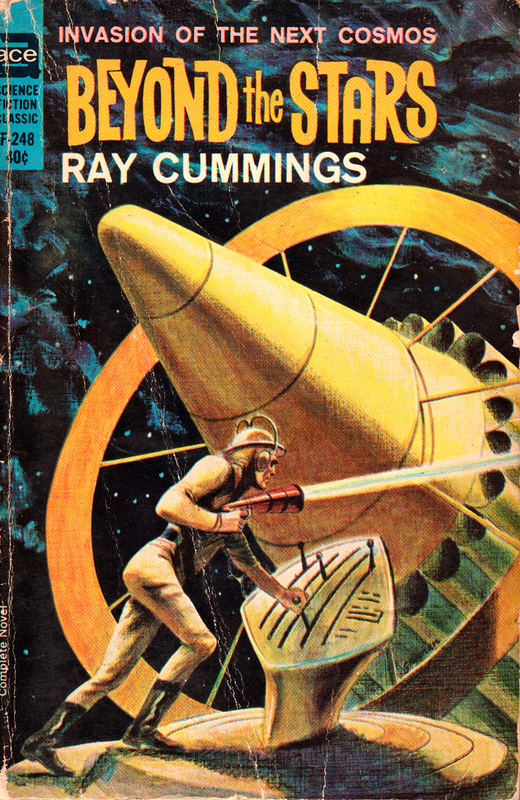 The man on the cover has some sort of ray gun (probably the Frazier ray, which plays a large role in the story), and it’s all yellow and action looking. I like it! Next Up: Alien Planet by Fletcher Pratt.